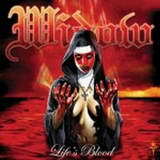 Before embarking on this review for North Carolina’s Widow latest installment Life’s Blood I checked how many comments (and what kind of comments) my earlier review for their Nightlife received. The answer is zero, zilch, nada. I am fine if people were fine with whatever words I put up for Nightlife, but it would be an absolute travesty if those who call themselves fans of 80s and NWOBHM metal are not familiar with Widow. Well, an opportunity to correct yourself is here, as Life’s Blood hits pretty much same notes Nightlife did a few years ago. The speedy fluid galloping, which is a staple of NWOBHM, makes the foundation for Take Hold of the Night or The Burning Ones, even if the former brings out painfully familiar riff I have heard somewhere before. Slowing down in parts to pay respects for mid-tempo grooves is another way some of these 3-4 min compositions unfold (Embrace It, Behind the Light). The songs on Life’s Blood are not meant to be exercises in sophistication, but they absolutely make impact with their immediacy, catchiness and sickeningly infectious melodies. Different in character, from more aggressive and meaty I Scream for Ice Queen to the stiff riff of Blood in Dreams to semi-smoochy closer The One I Know to the sappy beginning and anthemic growth of Another Fallen Angel, all songs on Life’s Blood are meant to entertain in the spirit of the early 80s metal, and they actually do. The vocals on Life’s Blood fit the style as a glove. Gone are a few grunts and growls, but I still hear a good deal of Blackie Lawless (WASP) in the weepy teary vocal deliveries by Widow. Never reaching Midnight’s highs in Crimson Glory, this is another US band from whose early albums Widow might have drawn some inspiration (Another Fallen Angel especially comes to mind). I understand why production on albums like Life’s Blood can never be slick (for the fear of ruining the experience), but the rattling and grinding sound of guitars with every snare kick and cymbal splash being this electric shock noise may be a little off-putting at first. Nightlife somehow seemed to be crispier, but did not suffer for it. Several spins and you will be used to the sound, however, so no grave worries in that regard. Widow is the band me and my high school friends only dreamed about putting together 25 years ago. This music is a transplant from those days, having skipped many a year. Remembering my youth, we never went past air-guitaring and searching for the instruments, while Widow has brought the journey to completion and us, old gizzards, may be benefiting from it now, even if some others call music like this outdated and cartoonish. I have a feeling the Widow members wouldn’t care as long they continue making music they enjoy most.